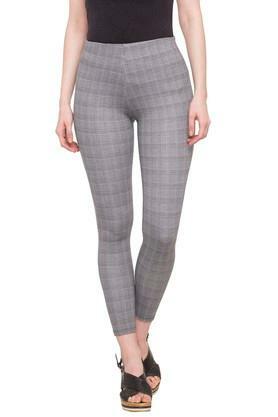 Women, who swear by refined fashion will surely love this pair of treggings from the popular brand, Kraus. It features a checked pattern that adds to the overall design, while the perfect fit enhances its look. It also scores quite high on the comfort quotient owing to the use of a good quality fabric in its tailoring. Make a distinct style statement by wearing this pair of treggings on a casual day out with friends. You can team it with a top and a pair of ballerinas to look chic.